with a prize of £10 to spend in her super shop. I made my card for my daughter's birthday last week and I used a Saturated Canary image by Krista called Violet and I coloured as usual with Copics. The papers are by My Mind's Eye, the border was cut with a Martha Stewart punch, I added flowers from Wild Orchid, metal corner and pearl pins from Hobby House, computer generated sentiment from a friend, ribbon and doily from my stash. 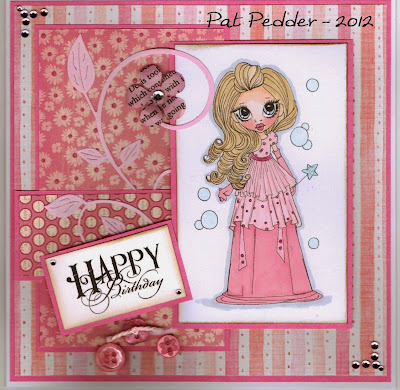 Good Monday Morning to you and what a gorgeous week we have had with the weather and also with all the beautiful cards you entered into our last challenge at Ooh La La Creations and I am sure we are going to see more beautiful creations this time as our theme is "Make It Girly". 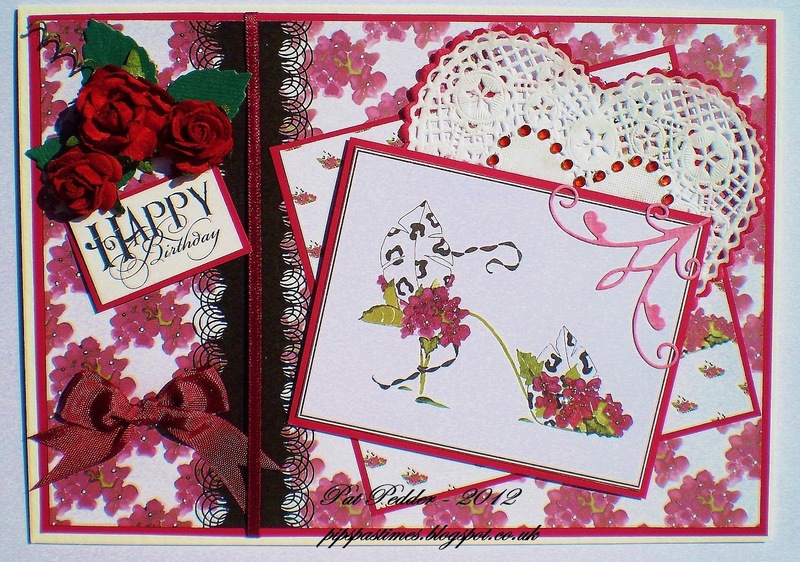 For my card I have used an image and papers from the Shoes in Bloom Part II CD, I added a doily with some adhesive gems, a corner cut with a Memory Box die, a bow, flowers and sentiment. Do take a look at the challenge blog and see the wonderful creations made by the DT ladies. Another gorgeous sunny day and I am a little late in posting my DT card for today. It was my granddaughter Emma's 7th birthday yesterday and by the time I got home last night I completely forgot to schedule my post for today. Now before I get to this weeks challenge I have some news for all you Fab'n'Funky challengers! Our leader Lou has sadly decided to stand down from the challenge blog due to having too many demands on her time. We're sad to see you go Lou and hope you'll come and visit us from time to time! That means its time for a change at Fab'n'Funky challenges and the blog is now "under new management " Lou has handed the blog over to Judith so its business as usual, I am sure Judith will do a splendid job and hope you all continue to support us. We would like to see new celebrations (home, baby, job etc) or new stash used on your project. 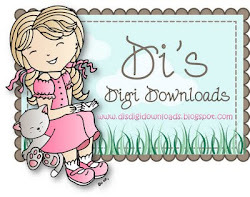 With a super prize of $10 to spend in her fabulous digi shop. 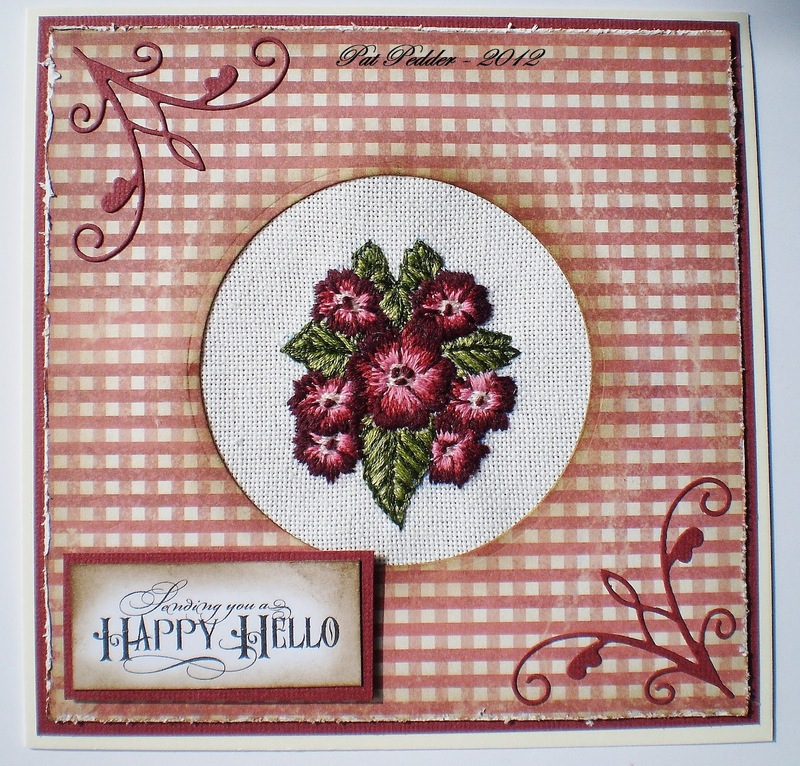 Now for my DT card I have used the new Portobello Road papers from Docrafts, my image is a Funstamps stamp that I have had for years coloured with Copics and I added flowers from Wild Orchid and a ribbon. Please visit the challenge blog and see the great creations by my teamies and we look forward to seeing your projects. Good Morning, Is this summer arrived at last, let's hope so, it felt so good yesterday to take Lauren for a walk in the really warm sunshine, even put suncream on her!!! "Take Two" - let's see two of something on your project. For my card I used the image "Wryn Blooms" from Tiddlyinks, I coloured with Copics and added some corners cut from Kraft paper. The dp is by My Mind's Eye, I used two brads, two ribbons, a tag, a charm and a sentiment courtesy of a blogging friend. 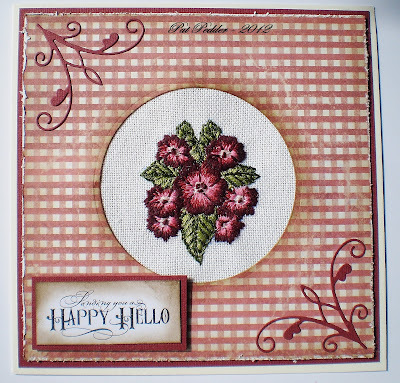 For my DT card I used a piece of fine linen and embroidered flowers and leaves with Anchor stranded cotton, I cut a hole in the centre of a piece of red gingham paper from the Portabello Road collection from Docrafts and edged with Distress Ink Walnut Stain. The corners were cut with a Memory Box die and I added a sentiment courtesy of a blogging friend. 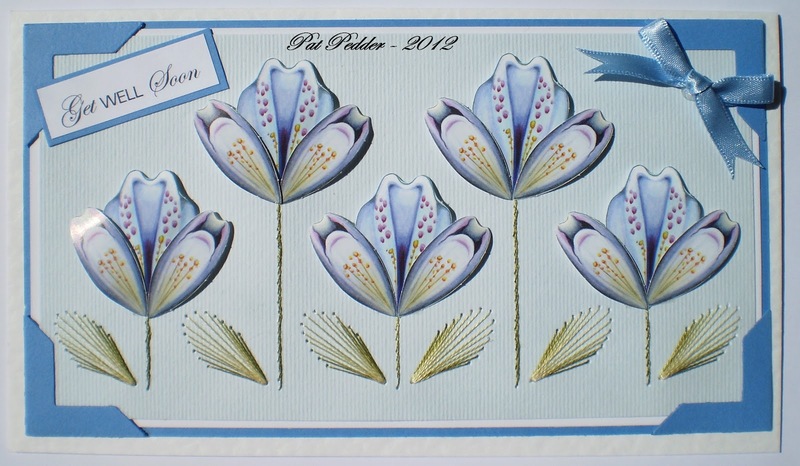 Do pop over to the challenge blog and see the beautiful designs by the team. Good Morning, I do hope you have all had a good weekend with plenty of sunshine, it's been beautiful here with just a little cool wind, but I'm not complaining. Well it's Monday so time for a new Challenge over at Ooh La La and our challenge this week is to use Ribbon/Twine on your projects. 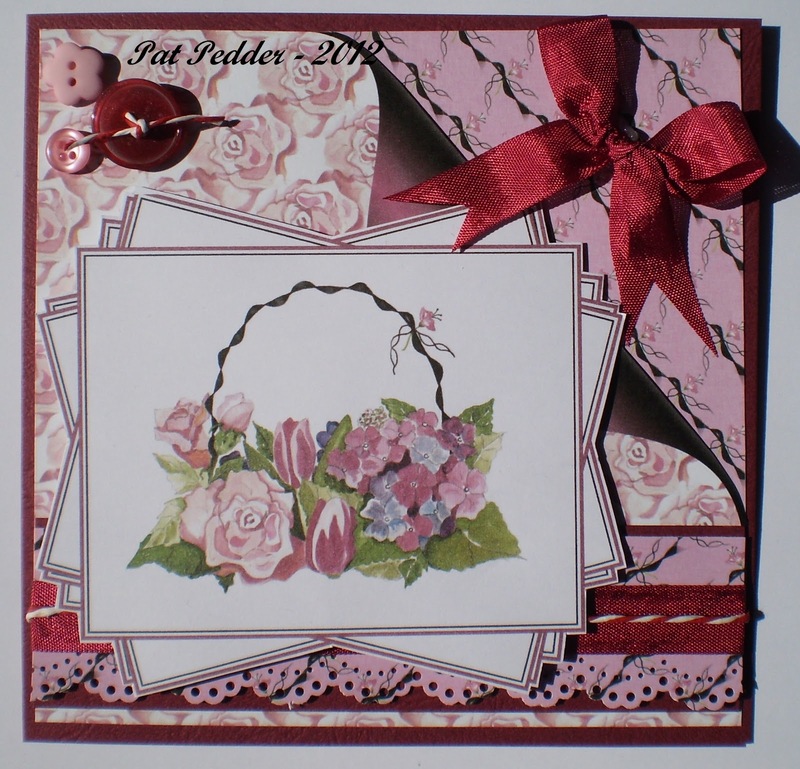 My DT card has been made using an image and papers from the "Shoes in Bloom CD Part 2", I added some buttons, ribbon and twine. 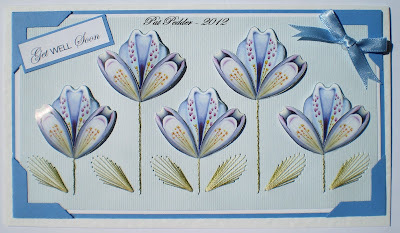 Do pop over to the Challenge Blog and see the gorgeous creations by our Design Team. I do hope you all had a good Bank Holiday weekend, though it was cold we had some beautiful sunny weather with just a little rain on Monday afternoon, but looks good again today. So come on let's see all your gorgeous cards for men. For my card I have again used a copy of one of my husband Alan's paintings entitled "The Chandlers - Burnham-Overy-Staithe, Norfolk". The papers are from the Bo Bunny Timepiece collection matted onto Coredinations paper, I added some card candy, ribbon, a key charm and a computer generated sentiment. Our sponsor this week is "Crimson Cloud"